Just over a week ago I've brought up the question of the ninth distillery for Islay? Ron picked it up as well. I'd like to claim that it was our combined questioning, but then again I believe the announcement was imminent anyway. Today Bruichladdich announced The Distillery Phoenix - Port Charlotte Distillery on Islay! As mentioned in my previous entry parts of the previous distillery are now used by the Port Charlotte Islay Youth Hostel and the Islay Natural History Trust, others are now home to a garage, yet others are in ruins. 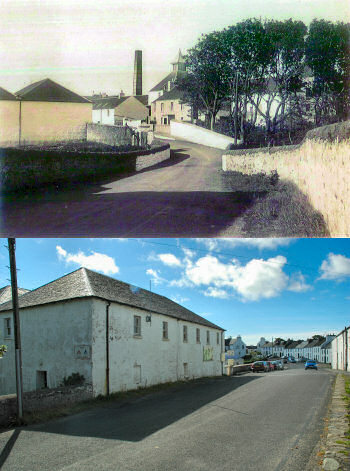 The combined picture should give you an impression, on the top an old view of the road going into Port Charlotte and the distillery. Just past the bridge over Abhainn Gearach seem to be warehouses on the left and the main distillery buildings on the right. The second, current picture is just past the bridge, on the left what's now the youth hostel, on the right you can just see the wall of a building now used as a garage. It will be very interesting to see how the new distillery will look and how it fits into Port Charlotte again. We have the chance to create an entirely ‘green’ distillery, with a genuinely zero carbon footprint by using all the latest environmentally sustainable concepts. The environmental movement is strong on the theory, but weak in the practice. It will be quite an engineering challenge to see what really is possible. As it usually takes around 10 years until a distillery has something to sell from the point it starts distilling we'll still have to wait quite a while to taste the new Islay single malts. Until then I'll have to make do with the Valinch I filled myself in 2003 which I only take out for special occasions. I'm enjoying a dram of it now, congratulations Mark, Jim, Duncan and everyone else on the Bruichladdich team, good luck and all the best for the Port Charlotte Distillery!